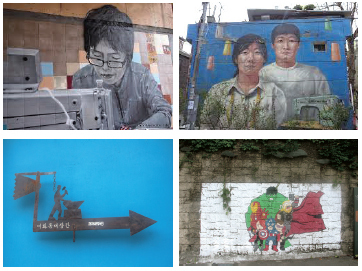 Near Hyehwa Station there is a special village where most walls around town are painted with beautiful illustrations. This village was broadcast several times as a lover’s dating course and also a tourist attraction. This village is called Ihwa Mural Village. On a TV program named “We’ve Just Got Married,” Gwanghee and Sunhwa had a date in this village, and on the program “1 Night 2 Days,” Lee Seung-ki visited this place and completed his mission by taking a picture with a wall illustration, on which wings of an angel are painted. As we see above, Ihwa Mural Village has appeared on many broadcasts. It is also one of the most popular tourist meccas for foreigners so there are always many outlanders like Chinese and Japanese. However, Ihwa Mural Village was used to be neither a tourist mecca nor a famous fliming site. It was rather a boring shantytown. Then what makes this village so special? What happened to Ihwa Mural Village? The UOS Times tried to figure it out. Ihwa Mural Village : From Where Did it Start? They painted the whole town with various colors and erected new statues. Tall and dry walls were changed into canvases so that artists painted beautiful illustrations on them. Steep stairs were painted as koi fish. Strolling through the alley, visitors can find several cafes, a supermarket and tiny experience centers where visitors can make art work like Korean traditional paintings and illustration by themselves. An unusual thing is that cafe offers to take pictures of customers in front of wall paintings with polaroid camera. Every shop is also painted with beautiful illustrations. Ihwa Mural Village is part of a project called “Art in the city 2006.” In the processing, artists not only simply added visual materials like huge illustrations or interesting statues around town but also put villager’s lives, joys and sorrows into their work. There are representative paintings like woman with sewing machines and two ordinary people like a boy and a girl. Especially in the boy and girl painting, the tape measures hung around their neck visualize the villager’s sorrows for visitors to feel. Unique Paintings : Avengers in this Village? There are a lot of peculiar paintings. Most paintings’ materials are daily things like wild flowers, fish and men. In that regard, the Iron Man paintings seem out of the blue, but that does not mean they are not good. Iron Man and the Avengers characters infuse this village with quaintness. The submariner painting seems a little incongruous, because a probability of being a villager whose job is a submariner is very low. However, replacing the head with a fuse box which already was there attracted my attention. It was very interesting. Interesting statues are also present at the village. Most statues are located on nearly the top of the village, along the handrail side. Red statue is a twodimensiomal type of a staue, not a three-dimensional one. It seems that they dance overwhelmed with joy. Among the most of statues in shades like grey or black, the intense red color of this statue was enough to catch people’s eyes. The second set of statues are somewhat out of place. They are made of short poles, piled up one by one. At the center of the each statue are yellow poles, a bright color. The yellow poles make the statues stand out. The dog statue beside the kid and the bird statue on the adult harmonize with the main statues, the two people. Located near UOS, it is worth visiting this beautiful village at least once. Plenty of wonderful paintings and old houses will make you lose youself in thought. Looking around Ihwa Mural Village, many foreigners were also touring this village. This means it can dare be considered a world-famous touring site. Please visit but do remember that it is a village, living foundation of some people. What I am concerned about is the excessive and loud visit of tourists and how this could annoy the villagers. Ihwa Mural Village is a village before a tour course. It is their home. As an actual example, the painting of the wings of an angel was erased by its painter because it had gained too much public interest after being shown on national television so nearby villagers expressed discontent derived from the crowdedness and confusion. Ihwa Mural Village is a wonderful place, worthy of visitors’ time. Nonetheless, visitors should have appropriate tour etiquette for both villagers and tourist themselves to preserve this place at best to be enjoyed by many others.